The water runs in trickles over the windows and the sky hangs as heavy as a blanket of lead over the city? Time to escape to the warm climates of the world in the greenhouses of the Botanical Garden and marvel at the wondrous things you will see: the Mickey Mouse plant from Kenya, for example, whose dark berries actually resemble the ears of the Walt Disney icon, or the kangaroo tree from Australia, plus mangroves and palm trees, bamboo and bananas. Succulent fans like me are particularly fond of the last of the five glasshouses: there you enter the desert and suddenly find yourself surrounded by cacti of all shapes and sizes, euphorbia, bromeliads, agaves. You would like to take an offshoot of everything! → LOCATION: Jungiusstr. 1 I Mon-Fri 9 – 15.45 / 16:45, Sat, Sun & Bank holidays 10 – 15.45 or 17.45 I Free entrance I Website / Google Maps . Ready for boarding? When it’s coming down in buckets, I like to ride the HVV ferries. You might think that Hamburg on rainy days is only made for sitting comfortably at the very front in one of the harbour ferries, while the spray smashes against the window and the shore, cranes and ships are only vaguely recognizable. Then I imagine how beer was ready for the dock workers after the shift and skat was played at the ferry tables for so long that some forgot to get off at home… Finkenwerder, Teufelsbrück, Elbphilharmonie, Ernst-August-Schleuse, Argentinabrücke – with an HVV day ticket you can combine different lines and create your individual harbour cruise. How great is that?! Click here for the timetables of the 7 ferry lines. Real crocodile tears, a 1.50 m long walpenis, the smallest compass in the world, Störtebecker’s wooden leg. These are the kind of treasures that pile up in a small captain’s house down at the beach at Övelgönne. I first visited the „Seekiste“, as the private museum calls itself, on a cold and wet Sunday last winter when Aunt Gitte was visiting Hamburg. Outside the wind whistled around the corner. Behind the frill curtains of the museum one felt like Mrs. Whaat on Morrowland (from the book „Jim Button“) – only that it was not Mrs. Whaat who told us stories, but Mrs. Lührs. She guided us through the rarities collection of her late father-in-law, the legendary „Captain Lührs“. He had never gone to sea, but had to become a boat builder because of a visual impairment. While his brother Max opened the „Strandperle“ across the street, the Captain filled his museum with strange seafarers‘ souvenirs from all over the world. In one room of his museum he even made himself a real captain’s cabin with berth. Around it he spun all kinds of sailor’s yarn, enough to make the thunderclouds in the sky completely forget. Finally space, lots of space!! This is for you, Wes Anderson! Hey, Wes! If you ever plan to shoot a movie in Hamburg, take me as location scout! I know some places that would be perfect for you! For example, the Cap San Diego. A white steel swan. From 1962 it traveled on the Atlantic as a freighter for the Hamburg-South American Steamship Company. From the engine compartment to the hatches, this ship would be the perfect place to send dysfunctional families on a cruise to Rio. I see sly-eared stewards and old countesses flirting in retro cabins, sinister killers sneaking through a midcentury style salon and a goggle-eyed boy in a purple suit arranging towels on the mahogany deck chairs… But, Wes, even if you are not looking for film locations, I recommend a visit on the largest, still working museum freighter of the world. You can find it at the Überseebrücke at Baumwall and a visit is especially worthwhile on rainy days. More location tips? When you’re here, Wes! Just leave me a message. Every 20 minutes the HVV bus line 111 transports passengers from Altona via the Fischmarkt and Landungsbrücken to HafenCity. 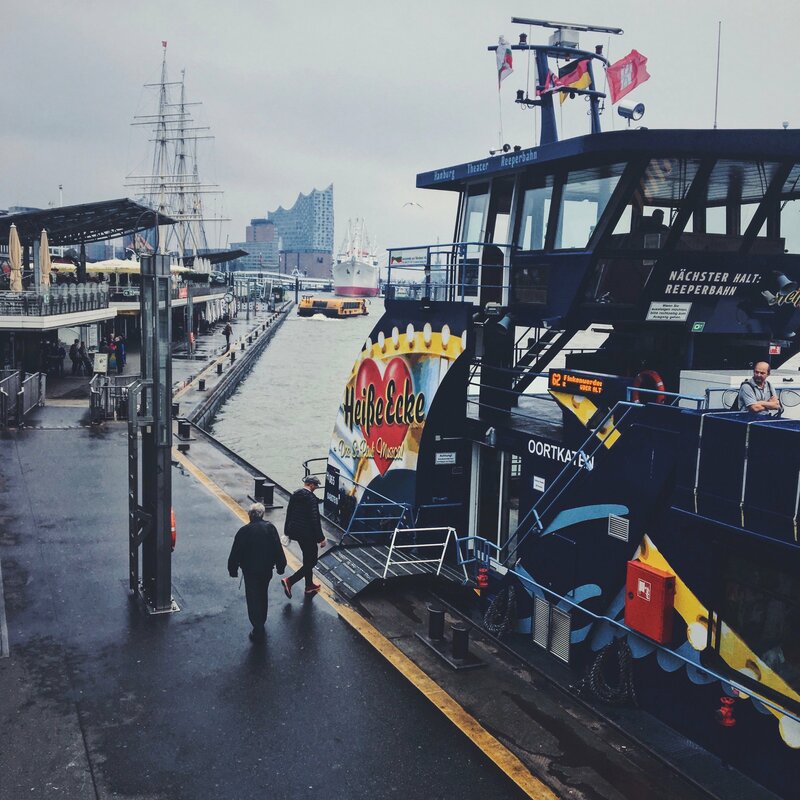 It explores a total of 16 Hamburg sights, such as the Altona town hall, the Reeperbahn, the Elbphilharmonie, the Speicherstadt… It is said that while on the 111 you’ll see a real Hamburg attraction every 111 seconds – perfect sightseeing when it’s raining cats and dogs. Don’t you think, Hamburg looks beautiful even behind raindrops on windows? Click here for the detailed route of this HVV bus line.